The biennial Pacific Cup attracted 64 entrants for the 2070 nm course from San Francisco to Hawaii, with the fleet divided among four staggered starts on July 11, 12, 14, and 15. Here’s a report from July 21. Strong winds propelled Manouch Moshayedi’s super maxi Rio 100 across the Pacific to set a new Pacific Cup elapsed time record. Crossing the finish on July 20 at 13:51:13 local Hawaii time (15:51:13 PDT), Rio 100 posted an elapsed time of 5 days, 3 hours, 41 mins and 13 seconds, knocking two hours off the record set in 2004 by Robert Miller, whose 139-foot Mari Cha IV finished with an elapsed time of 5 days, 5 hours, 38 minutes and 10 seconds. Rio 100 sailed a course slightly above the rhumb line for the entire race, taking advantage of breezes fed by the well-behaved Pacific High as well as remnants of Hurricane Celia. 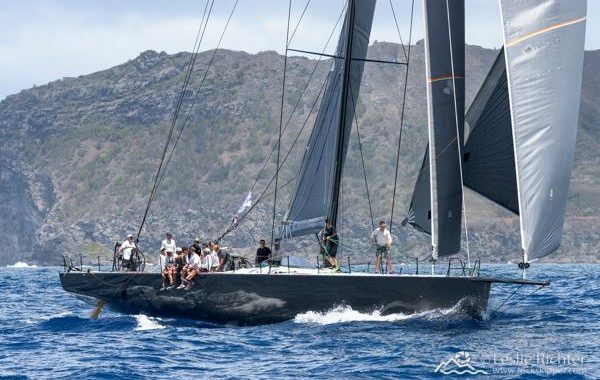 Many of this year’s crew of 16, including navigator Christopher Branning, were also onboard for the 2015 Transpac when Rio won the prestigious Barn Door Trophy with an elapsed time of 7 days, 5 hours, 34 minutes, and 07 seconds. We’re watching tropical depression Darby which has not dissipated as originally projected and is now forecast to cross the track of the fleet, potentially becoming an issue for those boats at the end of the fleet. We have consulted with Rick Sheema, The Weather Guy, and Commander’s Weather and have provided their input to the Pac Cup communications boat. We have authorized all boats to consult with any professional weather routing service without penalty. The preparation and equipment requirements for Pac Cup boats help to ensure that they are prepared for heavy weather that could be encountered between California and Hawaii. We will continue to monitor the situation and provide updates to the fleet. Background: The Pacific Cup Yacht Club is responsible for organizing the biennial Pacific Cup, dubbed the “FUN race to Hawaii.” Since 1980, the Pacific Cup has been sailed from San Francisco Bay to Hawaii every other year, and since 1988 the finish has been at the warm and welcoming Kaneohe Yacht Club on the island of Oahu. With an emphasis on pre-race preparation for the 2070 nm race, PCYC’s volunteer membership has helped to ensure that thousands of racers have been delighted with their Pacific Cup experience.